You are a great girl, an amazing creation of God, and you’re doing just fine. However, there are a few things you should know. You would do well to listen. Clothes. It doesn’t really matter what brand your clothes are or whether they came from the mall or Goodwill. When I just googled (that’s a long story, but just take my word for it that when you want to know something you “google” it) “Top Cool Clothing Brands” it sent me here. “Guess”, the brand everybody who is anybody is currently wearing, will be #34 on the Best Clothing Brands list behind something called “Wet Seal” and “Pink+Dolphin”. Oh, and there are 2 companies who ironically sell clothing using ads of people who don’t have nearly enough clothing on: “Abercrombie & Fitch” (#1) and “Victoria’s Secret”(#11). Nike and Adidas, however, are still the thing. Swatch watches are still around, but unrecognizable and boring, and Coke rugby shirts or Hypercolor shirts are only available on eBay now (another long story, but basically you can buy almost anything on eBay that ever existed, including clothes that are long recognized as overpriced or generally silly). “Units” clothes aren’t even available on eBay, which means they are even more obsolete than fossils (which are available on eBay). So basically, my point is to stop stressing about the clothes you don’t have the money to buy. Nobody will remember you for that anyway. Dress modestly, neatly, and how YOU want to dress as opposed to the latest hot thing. Guys. Now that is an important topic to you! Stop stressing about whether someone special will ever love you. Since you don’t giggle profusely, dress provocatively, or pretend to be generally stupid, the majority of guys your age aren’t mature enough to recognize your attractiveness. Those guys, who you so badly want to like you? Many of them will marry shallow, silly girls and end up experiencing heartbreak at their hands. Don’t be angry at them, for they have a hard road ahead to walk. The smart guys will wait until the time is actually appropriate to get into relationships, and then they’ll marry girls a lot like you. So, if nobody is madly in love with you when you’re 15, that’s actually a good thing. You will find a guy who, though not at all perfect, is perfect for you. He will appreciate your smarts and your talents and even your little quirks. You will laugh and love and live, and generally be happy. Relax. It will happen. Looks. Your body is changing, and you don’t know how you’ll end up. You currently are a not pear-shaped, or apple-shaped, as women are usually classified; you are string-bean-shaped. But you’ll have 5 kids and your body will change, morph, settle, and change again. Get used to it. Each stage as a woman is amazing. It is a wonderful creation, your body, so be okay in it and don’t worry about what it looks like, because honey, just when you get used to it, it’ll change. Success. The people who do best in careers are the very ones who are not popular now. All those things that make some teens unpopular, like maturity, patience, discipline, smarts, a love of learning, and many other not-the-prom-queen qualities, are the very things that serve you well in the adult world. The ability to throw a football or shake a pompom? Not so much. Your geeky friends will become physicians and teachers, professors and bank managers, engineers and physicists, nurses and composers. And you will do just fine, too . Friends. Pick friends who are good for you. Choose friends who you have something in common with, who make good choices, and who think you are okay just the way you are. Be kind to others and you’ll find that people will be kind to you. Those that aren’t? They just showed you that you don’t want to be around them anyway. There are lots of awesome teens out there who are making good choices, and having fun while doing it. Seek them out. Fun. Have a little. Don’t be so stressed and self-conscious that you don’t relax. Don’t do things you’ll regret, but also make sure you don’t regret not doing things. And those geeky kids that the cool people think are so serious and boring? They have the most fun of all. Bullying. If you see someone being bullied, stick up for them. Period. In your adult life you will continually be trying to help people who were picked on and rejected in their teen years. Small kindnesses are so simple to do, yet they can have a profound impact on a person’s life. Parents. Though they seem totally uncool, and they act oblivious to all rules of teen behavior, they are smarter than you think. They have loved and laughed and been through every single one of the things you are now going through. And since your parents are in the ministry, they have been exposed to more situations than you could ever even think of. That guy you think is amazing who won’t pay you any attention? They could help you deal with that . Trouble with a teacher? Yep. Need help with time management ? Yep. College and career decisions? Definitely. That suicidal friend? Yeah, they could especially help you with that one. God has given you 2 amazing people who love you more than anyone else in the world does, and you would be doing well to use that resource. So basically, relax. Have fun. Be okay with who you are, because who you are is a creation of the Almighty, and He doesn’t make trash. Oh, and that money you have invested in your first-ever stock purchase, namely Wal-Mart? Yeah, you really want to switch that to a company called Apple Computers. My husband is a professor at a seminary, teaching master’s degree students. He holds a PhD in Religion from Temple University. We were married the entire time he was getting his PhD, and we have spoken a lot about education since both of us are heavily involved in that field, though at very different levels. I had an epiphany the other day that I’d like to share. I realized that it’s not my fault. I didn’t know any better. In high school and college, given a research paper in nursing, history, music, or almost anything else, I could write a paper that would get an A. However, there were a few professors whom I just couldn’t please. These tended to be in literature classes. Looking back on it, and being married to a professor just like these frustrating people, I can totally see what I was doing wrong. And little did I know that I was probably frustrating them as much as they were frustrating me. You see, I thought a research paper was to exhibit what I had learned by doing research. Silly me. Well, they were to some extent, but now I know that to get that A, I needed to start making connections, drawing conclusions, and refuting ideas that I disagreed with. And there should have been things I disagreed with. I was supposed to not just answer questions, but to question answers. Most of my schooling was focused on the left side of this sentence. I was taught facts. I was taught processes. I was even taught catchy little sentences to help me remember a list of learning objectives. But I wasn’t really taught to think. Oh they tried. Through the same program that taught me about apes and elephants, a few of us had a “Gifted And Talented” class for an hour once a week in which we did exercises in logic, creative thinking, critical thinking, with a little art and writing thrown in. (I guess the majority of kids, who didn’t qualify for this program, were just up a creek.) But since it was only an hour a week, taken instead of one of our other classes (so the other teacher’s weren’t very thrilled about this idea of us skipping their classes), focused on the right side of the sentence with the other 31.5 hours on the left. No wonder my writing was shallow. These teachers in the G/T program were trying their best to pull the rest of the educational system along with them so that all could be more enlightened, but they were just scooping water from the ocean with a leaky cup; the ideas were not given the resources or attention to really take effect. To be fair, I’m still not sure how a teacher is supposed to get 25 or 30 students per class, with 5 classes a day, writing with not only correct grammar, sentence structure, and paragraph construction, but also get them to reach the next level and think critically instead of just spouting facts. So when I got to college and had trouble even getting B’s in literature classes no matter whether I spent 3 hours or 3 weeks on a paper (so of course I eventually figured out I should lean toward the 3 hours), it was very frustrating. But it wasn’t my fault. I hadn’t been taught to write in a way that exhibited THINKING. I had been taught to memorize, do research, write with proper grammar, and many other skills, but I must have missed the classes in how to THINK, draw my OWN conclusions and (gasp) ARGUE for them, and then write about THAT. Now that would have gotten me an A. So as I teach my children, I am teaching them facts. They should be able to find England on a map. They should know the steps of the scientific method. They should know how to construct a proper sentence. There are some things that we just need to know to be good citizens of the world. However, I am just as concerned that they learn how to ask questions, how to come up with their own ideas, and how to argue for their validity. 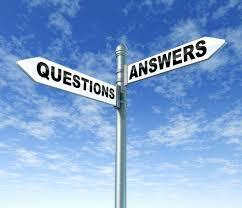 They should know not only how to answer questions, but also be able to question answers. So it wasn’t my fault. Nobody taught me differently. If somebody had just called me aside for 10 minutes and told me to take the next step, go to the next level, that 4.0 would have been mine. Walking down the corridor in the mall the other day I saw this advertisement. “YOU DESERVE TO WAKE UP HAPPY”. The pursuit of happiness, according to the U.S. Declaration of Independence, is one of those inalienable rights right along with life and liberty. However, many of us in modern times have accepted the notion that we deserve the happiness, not just the pursuit of it. What is happiness anyway? And how can we get it? Merriam-Webster defines happiness as “a state of well-being and contentment”. For most of history, and even today for many of the world’s inhabitants, people are doing good to have something healthy to eat, yet I meet many people who have plenty of healthy food to eat and yet do not exhibit “a state of well-being and contentment”. So what’s the deal? 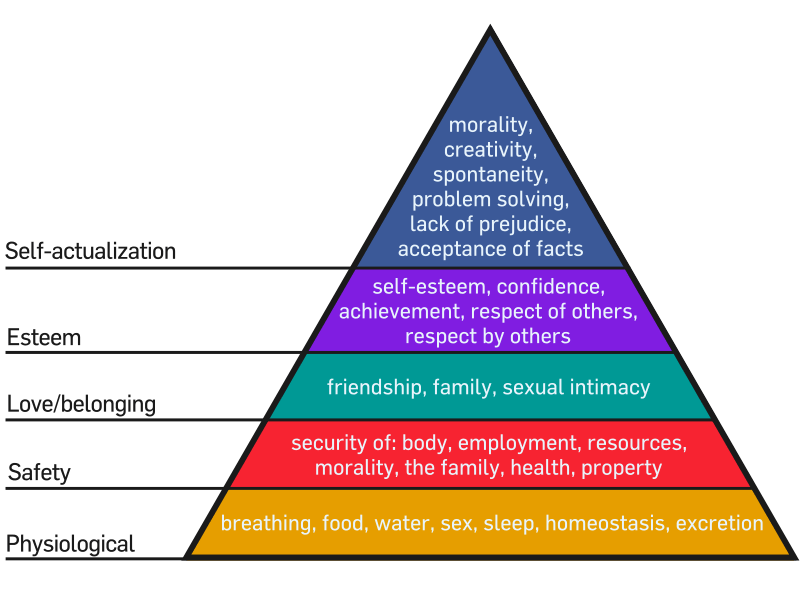 Abraham Maslow proposed in 1943 that there is a “Hierarchy of Needs“, and unlike some famous pychologists, I think he was onto something (instead of some who I think were just ON something). I’ll explain his idea, for those of you who didn’t encounter this pyramid in Psychology 101. The most basic physiological needs are at the bottom of the pyramid: little things like breathing, food, water, sleep, and some others. Once these needs are met, we automatically bump up to the next level. We don’t even think about it; we just do. This second level includes safety needs, with security of: health, property, family, employment, etc. You can see in the image that the items on the top three levels (respect, friendship, creative outlets, etc.) are things that most of us are still striving for to one level or another. This pyramid doesn’t have a big “Happiness” section at the top. This is because we cannot live in a constant state of “well-being and contentment”. Once we get one thing conquered, we move on to improving another item on the list. So happiness is not a constant. Sure, I have moments of contentment, but I don’t know anyone who lives in a constant state of bliss. If I did, I’ll be honest here, they would probably be very irritating. Life is a battle. As Maslow knew, we constantly fight battles. Some, like asthma or even lack of sleep, are important on the physiological level. Others, like natural disasters and danger of losing a job, are safety related. Others are less concrete, such as respect, friendship, and creative outlets. And what do I deserve, anyway? Without the blood of Jesus, I don’t deserve anything good. My righteousness, the best I can do, is like filthy rags. So I reject the idea that buying a new comforter set will make me wake up happy. I reject the notion that I deserve constant happiness. And I certainly reject the belief that a cat, whether smart or not, deserves the best. And, paradoxically, I will be happier than most.